The “new patient” appointment is scheduled with one of the doctors. It is our goal at this visit to spend time with you reviewing your health and dental history and learning about you and your health needs and desires. A thorough exam of the teeth, TMJ, occlusion (bite) and soft tissue will be completed. 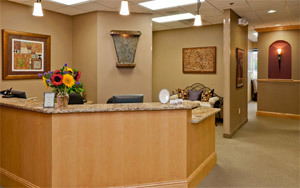 We will take dental x-rays (digital) as appropriate, and take and review intra-oral photos. This appointment offers a unique experience where we can take time to gather information, plan and discuss future appointments.